A sweat-soaked Peter Lawrie looks concerned for his tee shot on the 18th. Photo Jenny Matthews/www.golffile.iePeter Lawrie and Pádraig Harrington survived sweltering conditions to finish the opening day of the storm-delayed Maybank Malaysian Open within touching distance of the leader Kiradech Aphibarnrat. Lawrie, who celebrates his 39th birthday on Friday, had five birdies in a four-under 68 that left him just three strokes adrift of the Thai player, who fired a 65 and take the clubhouse lead before play was abandoned for the day due to a spectacular thunder and lightning storm in the afternoon. 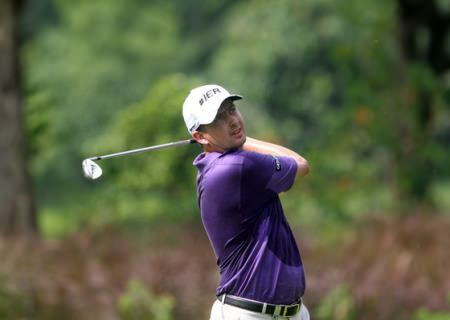 As for Harrington, the Dubliner had little luck on the greens but still mananged a 69 despite struggling for the first time in his career due to the humidity and high temperatures at Kuala Lumpur Golf and Country Club. “It’s okay,” Harrington said of his score after mixing four birdies and three bogeys in his 69. “I’m not sure what’s leading but I’ve had a lot of chances, I’ve hit a lot of good putts. Some didn’t go in but I feel like I had a low one in me, but I am not disappointed either with three under par. “I missed a good few putts early on, a couple of short one, but they weren’t bad putts. I didn’t hit a bad putt today, hit a lot of good ones. Then I hit a few close, made a few birdies, and that gave me some comfort. “I made a kind of fortunate birdie on my 16th hole. I hit my tee shot in the right rough and it plugged and it took us four minutes to find it. I got a nice drop, hit it to 20 feet and holed it. Padraig Harrington wipes sweat off his face at the 16th. Photo Jenny Matthews/www.golffile.ieForced to put a new driver in the bag in the final round last week in Thailand after the face of his favourite R11 gave way, Harrington hit only a handful of fairways in the opening round but he had more complaints about his ability to withstand the heat. Drenched in sweat, Harrington he admitted that he’s struggled to cope with the high temperatures and humidity in Asia since he put on around a stone over the past six months as part of his bid to build muscle and hit the ball further. “I am normally very good but I am suffering,” said the world No 54, who confessed on his blog that it was fatigue that caused him to “hit the wall” and shoot that costly, third round 75 in Thailand last week. It’s a massive challenge to keep his news glasses and everything else, sweat-free and he’s drinking “lots” of water to remained hydrated. Gareth Maybin was four over after seven holes after a miserable start. Gareth Maybin takes cover from the heat. Photo Jenny Matthews/www.golffile.ieThe Ballyclare man started with a double bogey seven at the 10th and then bogeyed the 11th, 12th and 13th to soar to five over before getting a shot back at the 14th. Lawrie has made a solid but unspectaclar start to the season and is 70th in the Race to Dubai after missing just one cut in his first seven events. He opened with a birdie at the par-five 10th, bogeyed the 199-yard 15th but then picked up shots at the 16th and 17th to turn in two under before coming home in 34 with birdies at the third and fourth. World No 3 Luke Donald struggled to a two over 74 after only arriving in Malaysia from Florida on Tuesday. “Today the game was quite tough for me,” Donald said. “It’s one of those courses where if you’re a little bit off, it can get you. But if you’re on your game, there are lots of opportunities. I didn’t play the hard holes very well and if I did have an opportunity I couldn’t take it on the green. “I couldn’t get any momentum going all day. I had a nice birdie on the last and hopefully I can use that to kick-start tomorrow’s round. “I made a slow start - three over through four – and I was just hanging on after that. There’s a lot of trouble out there and I found too much of it today. Golf is hard sometimes and not always going to go your way. I gave it my all but the result wasn’t very good. “The weather is too hot and the thyroid disease is making me feel tired. Honestly, I didn’t have enough energy to hit long drives. I’m still taking medication for my thyroid condition and I’ll consider going for an operation when I consult my doctor in six months’ time,” said Kiradech. “I didn’t force myself or any of my golf shots. I didn’t set any goals. I didn’t tell myself that I should finish in the top-five or win this event. I want to take it shot by shot. When you don’t have power or energy, you can’t force yourself,” he added. Denmark’s Anders Hansen, playing with Kiradech, birdied his last three holes for a fine 66 which was matched by Ryder Cup star Edoardo Molinari of Italy and Frenchman Gregory Bourdy in the event co-sanctioned by the Asian Tour and European Tour. Play was abandoned at 4.05pm due to a heavy thunderstorm, with 78 players to resume their opening round on Friday morning (7.45am). Scott Jamieson of Scotland was six-under through 10 holes while 2011 Masters Tournament winner Charl Schwartzel of South Africa and China’s Wu Ashun stood at four-under through 11 and 12 holes respectively. Molinari, a two-time European Tour winner, produced his best round since last March after starting to work with Sean Foley, who also trains 14-time Major champion Tiger Woods. “He (Foley) is making big changes. I need big changes because I didn’t like the way I was playing last year. I felt it wasn’t right. I felt it was time to change. I like what he says and I have a lot more knowledge on what I’m doing on the golf course. As soon as I missed a shot on the course then I know how to fix it,” said the Italian, who carded eight birdies. A sweat-soaked Pádraig Harrington en route to his bogey at the fourth. Picture: Jenny Matthews/www.golffile.iePádraig Harrington and Peter Lawrie face a gruelling 12-hour day when they return to the oppressive heat of Kuala Lumpur Golf and Country Club at dawn to complete their second rounds in the weather-delayed Maybank Malaysian Open. 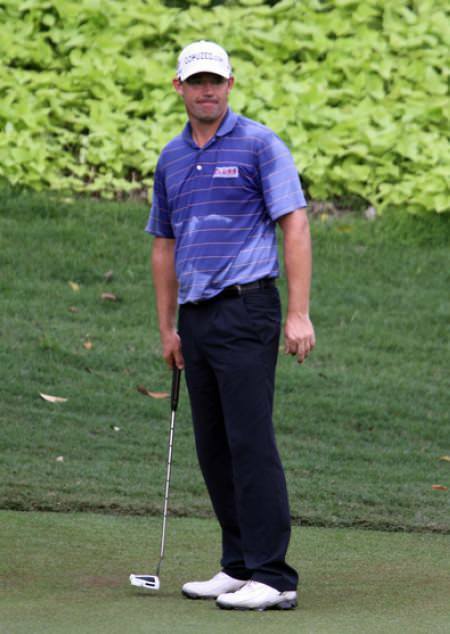 Pádraig Harrington drives on the 17th during the second round in Malaysia. 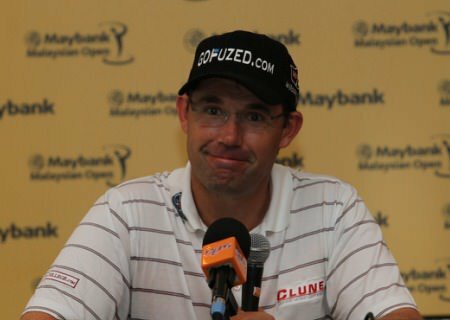 Photo: Jenny Matthews/www.golffile.iePádraig Harrington and Peter Lawrie are in position to end their five-year European Tour droughts after the Maybank Malaysian Open was reduced to 54 holes. Peter Lawrie got off to ta great start in Korea. Photo Jenny Matthews/www.golffile.iePeter Lawrie overcame a double case of blindness to get off to a flying start in the weather-delayed Ballantine’s Championship in South Korea. McGinley on European qualifying changes: "It will just boil down to my gut feeling"